← What Kind of Mentality Kills Teenagers Because They are Jewish or Palestinian? I’ll Tell You What Kind. Is This Editorial Cartoon Funny? People enjoy political cartoons. They make for fast iconic processing and cut to the quick of a point. 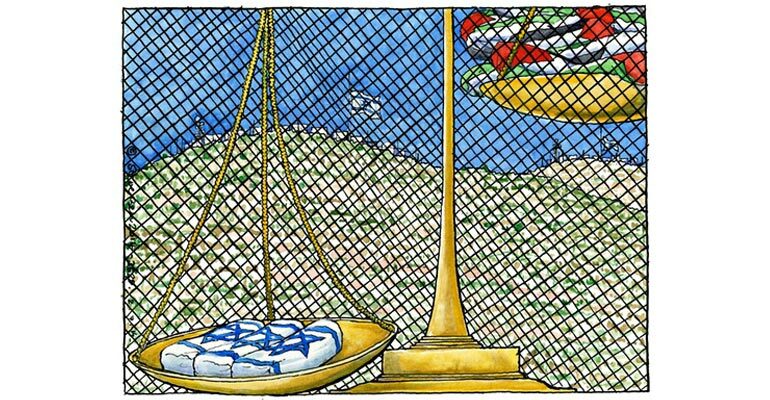 This cartoon by Steve Bell is clearly cynical and anti-Israel. Its essential point is clear enough – that Israel values its own lives greater than that of the Palestinians. An even deeper and more cynical and insensitive interpretation would be that “only” three lives are considered more significant than all of the Palestinians. But the cartoon does represent the mindset that characterizes the perception of Israel. On the one hand, any culture disproportionally prefers its own people and interpretations of its culture that are favorable. Why wouldn’t an Israeli, or an American, or member of any other culture be at least just a little biased towards its own people and political conditions? But this cartoon doesn’t state an obvious political reality; it’s not a simple statement of support and preference for one’s own that anyone can understand. No, it’s an indictment. It is a charge that Israel considers itself to be superior, that the lives of three teenagers (three coffins draped in an Israeli flag) are considered more important than all the Palestinian suffering. Political cartoons that are rich in interpretive possibilities lend themselves to multiple issues and implications. This one not only accuses Israel of unfair and biased attitudes about human life but also speaks to the issues of moral superiority and moral equivalence. It accuses Israel of considering themselves to be morally superior, which is why the death of the three teens outweighs the Palestinian experience or the other side of the scale. And even though, as referred to above, this is common enough and true of any political culture in the hands of a cynical cartoonist it becomes an accusation. Moreover, as part of this bias towards one’s own group, there is the matter of moral equivalence or the belief that your own group is equally as justified as any other group. If the killing of the three teenagers was the act of a crazed individual (such as in the case of Baruch Goldstein) then that is different than it being a political act. But if Hamas for example consciously planned to kidnap and kill three Israeli kids coming home from school as part of a political statement, then an aggressive response is justified. One of the most pernicious aspects of the Israeli-Palestinian conflict is the sense of moral equivalence on both sides. The Palestinians believe they are morally superior because more of them have died, and the Israelis believe they are morally superior because of their developed political culture as well as the conviction that they are a legitimately established state that is surrounded by enemies and simply defending themselves. Research on political cartoons reports that cartoonists want to expose the system and encourage resistance. They clearly have an agenda, which is fine because that’s their job. But a persistent bias toward one issue is no different than any journalist engaging in conscious and systematic bias with respect to an issue. An editorial cartoonist is particularly adept at exposing hypocrisy and absurdity and these cartoon moments are powerful when there is a consensus recognizing hypocrisy and absurdity. But a cartoonist who simply hammers away portraying his or her own biased political perspective is little more than a journalist hack. Political cartoons are naturally critical and typically have a sharp cutting-edge humor and insight to them. And this is why we enjoy them. If they subvert those in power and draw attention to the corruption of deep or sacred principles than editorial cartoons are powerful communication forces. A cartoon may not prompt revolution in the streets but it can be and should be oppositional in the most honorable sense. If we laugh or see ourselves in bitter recognition then the cartoon is successful. But propagating an indefensible cultural stereotype aimed at one culture and interpreting that culture through a single lens (the accusation of Israeli moral superiority in this case) moves beyond insightful cartoons into the realm of rank bias. Posted on July 14, 2014, in Communication and Conflict Resolution, Israel, Media and politics, Political Conflict and tagged bias, Editorial Cartoons. Bookmark the permalink. Comments Off on Is This Editorial Cartoon Funny?.